19 Items. Showing Items 19 thru 19. Circa 1825. Baltimore, Maryland. $5 Note. 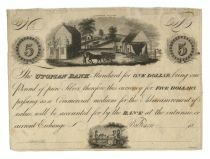 “The Utopian Bank standard for one dollar being one pound of pure silver, therefore this currency for Five Dollars passing as commercial medium for the admeasurement of value will be accounted for by the bank at the intrinsic or current Exchange.” Highly detailed engraved vignette of a utopian society at work. A small tear in the paper in upper right corner with some tape residue from its repair. Small archival tape repair at margin in upper left. A rare note and very unusual. Unissued and fine.